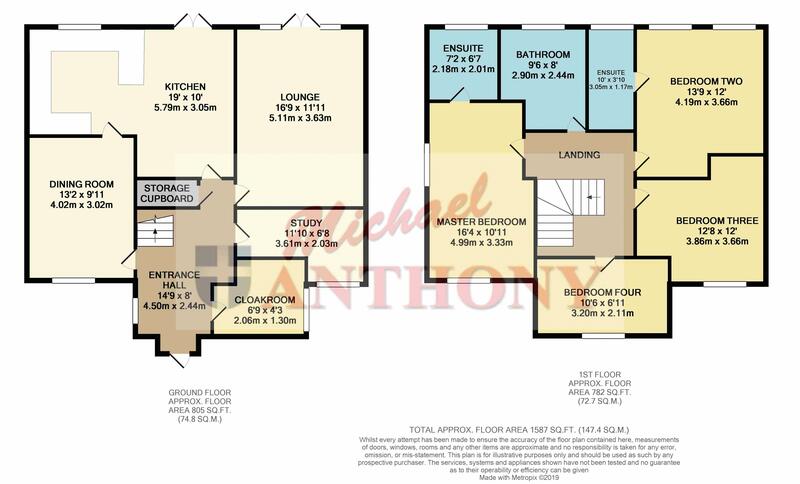 Michael Anthony are delighted to offer this double fronted four bedroom detached family home. Entering the property you go into the entrance hall with tiled marble flooring which provides access to the guest cloakroom, study with a front aspect, family room with dual aspect and quick step flooring, lounge also with quick step flooring and patio doors opening to the rear garden and a kitchen/diner that benefits from built-in appliances, a breakfast bar and marble tiled flooring. To the first floor there are three double bedrooms and a single bedroom with the master bedroom and the second bedroom benefiting from en-suites, both with double showers. There is also a family bathroom. Externally the property has a part walled rear garden, driveway parking for approximately three vehicles and a garage.